Because they didn't tell you, I'm going to say it out loud. When I had my first baby, I had some pretty romantic views of early parenting. I imagined snuggling his soft, warm little body as he slept peacefully. Or playing on the floor together. Or walking in the mall with him happily strapped into the stroller. At no time did I imagine walking up and down my hallway, with tears running down my cheeks, desperately trying to get him to sleep. I also didn’t realize that he wouldn’t ever want to play on the floor and instead would want to be bounced 24 hours per day. I never dreamed that he would hate the stroller. I also never imagined feeling so utterly and completely like a failure. It was so much more difficult than I had ever imagined. It’s quite likely that I spent as much time crying as he did. For the first three years of his life, I assumed that I had somehow spoiled him and created a demanding baby. I thought perhaps I was doing something wrong. I would talk with other moms when they had their baby and they would look at me blankly when I said how hard it still was for me after a year. Or they would say only that the first few weeks were tough, but then they got the hang of it. I would stand there, silently wondering what was wrong with me, because I still didn’t have the hang of it, and my kid was a toddler! Equally disheartening was seeing parents with their calm child in tow, smugly looking at me and my crazy boy. And judging me. Clearly, judging me. 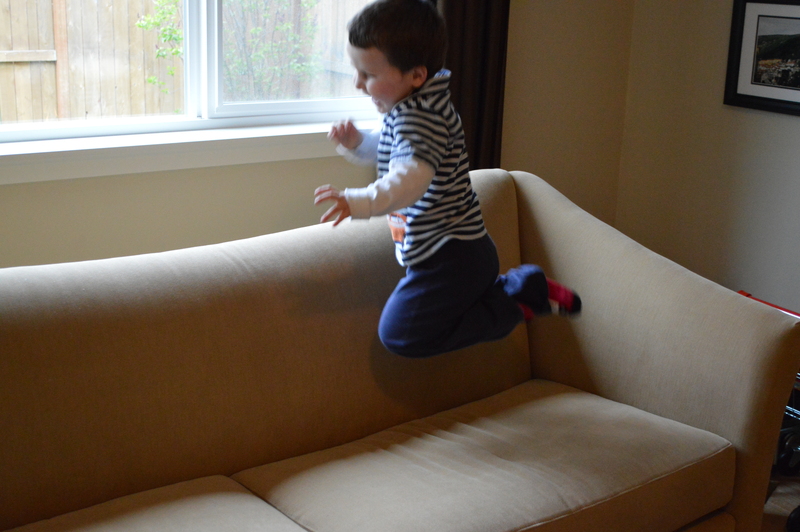 Jumping on the furniture is one of those battles I chose to let go! But then, I had another baby. A baby who slept well on her own. Who would have been perfectly content to have me snuggle her while she peacefully slept, or not. One who loved having toys rattled for her while she cooed on the floor, or (*gasp*) she would entertain herself! Besides showing me how easy some babies could be, she showed me that I was not the person who had made her older brother who he was. He was simply who he was; not someone that I created out of my inexperienced parenting. For all those people out there who weren’t blessed with a difficult baby, stop acting like it’s your amazing parenting skills that made your child compliant and well-behaved. Stop looking at me with that look that implies that if YOU were their parent, they wouldn’t behave like that. All those techniques that so easily worked for you won’t necessarily work with my kid. I guarantee that I have worked longer, harder, and more tirelessly than any of you to get us to where we are now (people only judge me every once in a while at this point). I’ve been a parent for five years, and I still sometimes find myself at a loss for how to be a good parent to my kids. I still cry in frustration at times. But now that I see the stark differences between my own two children, I can remind myself that everything is not my fault. People are who they are. Sure, I can guide how they grow and nurture them to be good and kind people, but I didn’t create their temperaments. They were born with those, and that is outside of any parent’s control. So, if you are the parent of an easy child, please be thankful, not judgmental. And if you have a child who challenges you at every step, try to ignore all those people who assume you are doing something wrong. I try to ignore it, and just wait for the age when all those difficult traits become assets. And those difficult traits DO become assets. We all come in being who we are. Our parents do the best they can with us, but each of us is more than just a product of our upbringing.